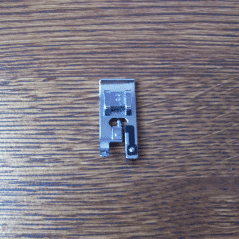 Most sewing machines come with a number of essential presser feet to help make your sewing projects easier. These feet will help simplify sewing on buttons, zippers, cording and the list goes on. If your machine did not come with a particular foot, then you can always buy it separately either online or at your local sewing center. 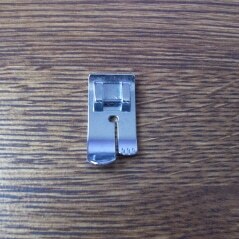 Always use a foot designed for your sewing machine. Otherwise you could run into problems. Here is a basic overview of some of the basic, or most used presser feet. Please note that each brand of sewing machines will have a different style of presser feet, but they will generally function the same. 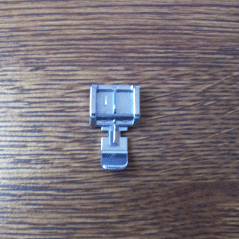 The All-Purpose foot is the one most widely used for your sewing projects. 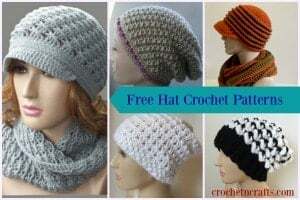 You can use it for straight stitching or zig-zags. The hemmer foot has a scroll where the fabric is fed through to create rolled hems. It can be purchased in different sizes for different hemming widths. 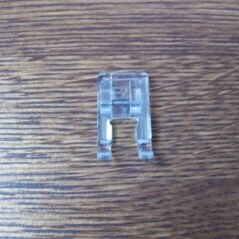 The blind hem foot is great for making blind hems with your machine. It has an adjustable guide to control the fabric feed for precise stitching. An overcasting foot is used to sew around the edge of the fabric in a zig-zag motion to prevent the fabric from raveling. It has narrow metal plate or wire to hold the edge of the fabric down so that it does not curl as it passes through the machine. The satin foot has a groove on the bottom to allow for an even feed of the fabric while the thread builds up in decorative stitching. It can be used for monogramming, embroidery, and to attach applique using the zig-zag stitch setting. 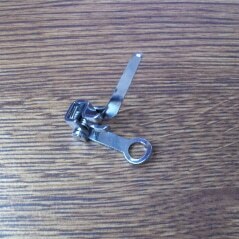 The zipper foot can be attached to the left or right side of the needle to enable you to sew both sides of the zipper. 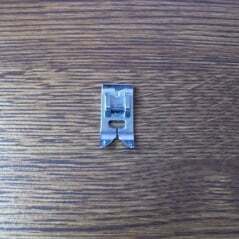 It can also be used to attach cording or any seam that has more bulk on one side than the other. 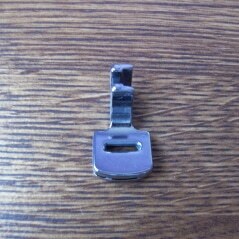 The invisible zipper foot pictured is attached to the shank adapter. The invisible zipper foot is essential when it comes to inserting invisible zippers. 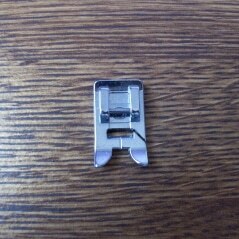 It has two grooves on the bottom for the zipper teeth to feed through. 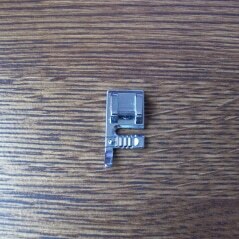 The button hole foot is adjustable to help you to make any size of button hole. The darning plate is placed over the feed dogs, (located underneath the presser foot,) to prevent the fabric from feeding through. 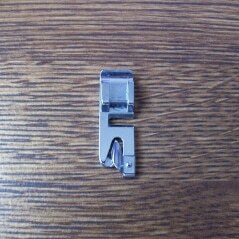 It is used when sewing on buttons or when darning. 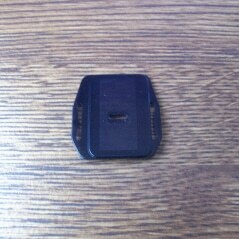 The button foot helps you to easily sew on buttons. Make sure to use with the darning plate. 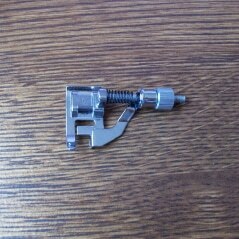 The darning foot is used for darning and free-motion machine embroidery. The cording foot is used when applying a cord. The cord threads through the cording foot and automatically feeds during stitching. The gathering foot creates even gathers in the fabric as it is being stitched. The open toe foot is used to sew intricate designs into the fabric. The openness allows you to see the stitching lines more clearly. It can also be used for machine embroidery and satin stitching. The quilting foot has a small hole in the center which helps to hold the quilt batting down firmly around the needle as it is being stitched. 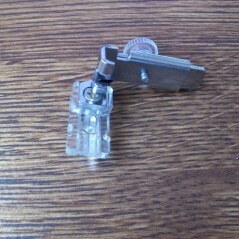 The quilting foot is essential to keep the seam allowance straight as you stitch. Simply line the edge of the fabric up with the edge of the foot as you sew.